In this final part of “The Emotional Brain” Submerged in the Left I’d like to propose 4 principles which must exist in an organization in order for it to be healthy and successful. These principles are all based upon the concepts discussed in the previous parts. If you have not read them, I strongly suggest doing so before proceeding. An organization which aims to change society must be fundamentally committed to learning about the class nature of the society in which it exists. Without this, the development of its political worldview becomes severely flawed, divorced from reality. This blindness, in effect, is submission to the oppressive class forces which exist in society. Historically, this political awareness in Marxist circles has been referred to as Class Consciousness. I believe this point is more accurately called “environmental consciousness.” Despite the fact that class is the predominant force that defines the trajectory of society, it runs far deeper than simple economics. Environmental Consciousness refers more broadly to a person’s awareness of the many manifestations of oppression in the environment that influences, either positively or negatively, an individual’s perception of the world around them. This includes oppression based on race, gender, sexual orientation, nationality, and class. Environmental Consciousness extends the Marxist method beyond economics simply by connecting it to our emotional appraisals of the world around us. Concretely, this means spending an adequate amount of time on research and analysis of a topic that individual comrades find interesting and important. All this must occur, while also sharing each other’s personal encounters with oppression. This process of exchange and education should be a communal one, as well as an individual, to establish a culture of environmental consciousness. Most existing organizations focus their energies on assimilating new members to a party line by directing their attention towards a pre-existing list of essential works. These works, in the view of the organization, are integral to constructing an informed worldview. This is a static and alienating political tactic, regardless of how strict or militant an organization’s political program is. It naively presupposes there is one lens, one seat of consciousness, which is necessary and essential for affecting social change. It is in limiting a person’s environmental consciousness to the issues with which an organization concerns itself that isolation begins. It is political isolation which inspires sectarianism. By being committed to flexibility and acceptance, an organization challenges its members to seize knowledge and share it. This principle encourages rather than alienates. 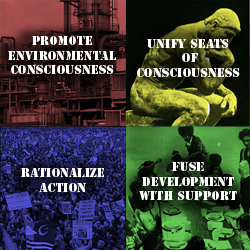 The second principle of radical organizing stems directly from the first: while environmental consciousness, as the term suggests, refers to types of oppression in the environment around an individual, a seat of consciousness refers specifically to an individual’s rationalization of his or her life within that same environment. Rather than approaching different views as counterposed to one another, this principle aims to unite what is common. This is not something as narrow and superficial as looking for what is agreed upon by two conflicting views. It is a determination to find why a particular political view comes into existence. To do this, one must accept the unity between a person’s environmental consciousness and how this ultimately shapes one’s particular seat of consciousness. This starts with placing more value on WHY a person holds a particular opinion than on WHAT their opinion is. It is through seeking this deeper understanding, upon which sympathy and empathy are founded, that we achieve unity. Establishing a safe emotional space for healthy exchange is a prerequisite for unifying seats of consciousness. Conventionally, there is far too much at stake in debates and political exchanges, especially public ones. It is in this atmosphere that people become concerned with being correct and besting the other, instead of encouraging understanding and clarity between different people. This practice should be just as informative for comrades working together as it is for the oppressed who may attend these forums of debate and exchange. By encouraging all leftists to join and create such spaces, we strengthen our movement by including a diversity of perspectives. This is not something that stops when “everyone agrees,” but rather a non-stop process of discussion and expansion. In unifying these perspectives, we create not assimilation, but tolerance and acceptance. When a community of leftists feels confident in its existence as a body, the question of communal action comes into play. Before elaborating on this third principle, I want to make clear that no organization should ever restrict its members from acting autonomously politically. This is an unconditional freedom. That being said, when it is decided that a collective political action is appropriate, there must be a degree of discipline and structured procedure for the sake of individual as well as for organizational clarity. This is accomplished by requiring that all propositions for collective actions have a clearly articulated goal, means to accomplish the goal, and period of reflection that follows. Once proposed, all members of an organization must dialogue and reach an agreement on the action. It is here where suggestions and feedback on the means of accomplishing the action’s goal must be submitted and discussed as well. This extends the democratic process beyond deciding on a simple proposition to the ideological makeup that inspires an action. By fusing education with every action, necessitating competence and seriousness between comrades, this establishes a professional attitude about the political work. By doing so, leftists are enriched by the communal discussion of action regardless of its outcome. If the action is solidified and carried out, a period of reflection must follow where comrades meet and discuss the successes and failures of the action. This principle aims to synthesize action with reflection. It is a principle of Praxis. This fourth principle is the foundation on which the others rely. While the appeal of most organizations is embodied in what they offer programatically in addition to how they support a particular “cause,” rarely do they support their members’ livelihoods. I believe this is why there is a crisis of “cadre” (full-time activists). This was not always true for organizations. Being a professional revolutionary used to mean something tangible. Although this privileged status was given almost exclusively to vanguard parties with the financial means to pay their members’ expenses, the strategy is effective. It allows current and future members to fight with minimal dependence on capitalism as a means of subsistence. This frees them to pursue a more ambitious place in the left and provides the organization with a more effective means of acting within society. A healthy leftist organization must offer both political development as well as socio-economic support to all of its members. The aim of this principle is to better equip leftists as agents of social change. Undercutting dependence on capitalism through organizational support eases the intensity of the workweek, opening up more opportunities for political work and education. This is a friendly gesture, which acknowledges the toils of oppressed working people rather than demanding yet more work from the masses. This is also something that can take on many different forms – communal spaces, food kitchens, donations, childcare, education, etc. When we, as leftists, step back and commit ourselves to growing as a social force that interacts with the oppressed working class people, we can create a political environment of radical ideals, education, and communal resources. For newly developing organizations or ambitious leftists looking to organize, I hope these four principles are useful guiding steps.